Desirable dream, have you ever dream to achieve the dream of beauty and have a killer figure like any international superstar? 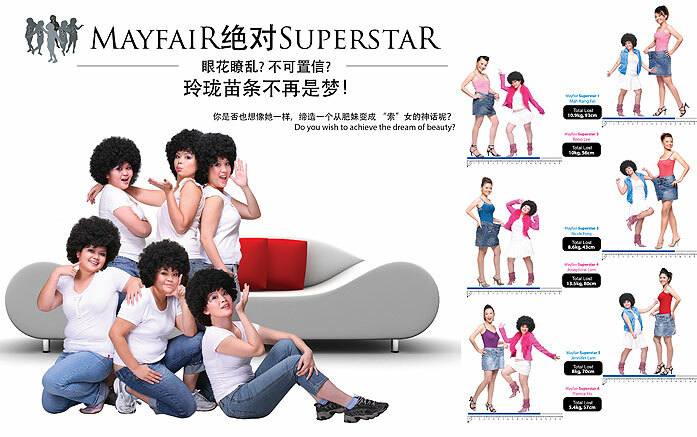 On 2006, Mayfair Group had waves their magic wand and helps a group of 6 ordinary chubby ladies to trim down their body into a superstar figure! Popular for their advanced slimming and dermatological expertise, Mayfair Group is the centre that designed unique nutrition plans and programmes to suit individual requirements. Most women accumulate fat in their thigh and hips if nothing is done over a period of times, the fat become stubborn and harder to lose even you have start exercise regularly. Mayfair Bodyline is able to give you the right matter which understand and effectively help you deal with the problem! Nothing is impossible, if you are determining to achieve your dream, we can help! Feel glamorous and outshine your branded figure like a superstar!